German food has a bad health rep. And for the most part, it deserves it. Take the classic German cake (Kuchen): layers of sponge and liquor-flavored butter cream, marzipan icing, whipped cream piping. The recipe starts with nothing less than two cups of butter, three eggs and a whack of sugar...you get the idea. 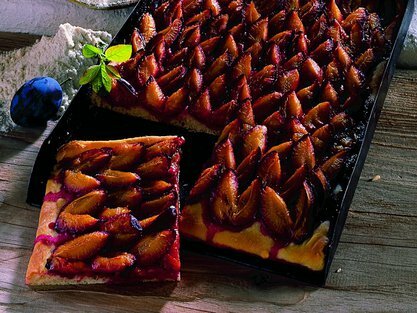 Thus I was surprised to discover, upon moving to Munich a few years back, a popular late-summer dessert featuring plums baked on a simple, lightly-sweetened yeast dough base. It's a snap to make, impressive to serve and just about qualifies as a serving of fresh fruit. This cake uses small, dark prune plums that are harvested from July to late September. In the U.S., they are known as Sugar Plums or French Prunes and can be found in farmers' markets. 1. Place milk in a large mixing bowl and sprinkle with yeast. Let stand until mixture is foamy, about 5 minutes. Add flour, sugar, salt, butter and egg; mix to combine. Replace mixer with a bread hook and knead until a smooth dough forms. Turn dough into a bowl and let rise in a warm place (a 125 F degree oven works perfectly) until double in size, about 45 minutes. 2. Punch down dough and knead with hands to make a workable dough. Place dough on a floured surface and roll it out to fit into a buttered jelly roll or sheet pan. 3. Place the plums in tight rows skin-side down, slightly overlapping, and press gently into the dough. Bake at 350 F degrees for 25-30 minutes until dough has cooked through. Serve at room temperature with plain or lightly sweetened whipped cream.